Daniel Hall was born September 11, 1819 in Bury, Lancashire, England. He was the son of Samuel and Alice Brown Hall. On October 13, 1840 Daniel married the lovely Mary Barlow in Radcliffe, Lancashire, England. Mary was the daughter of James and Pricilla Nuttal Barlow. Daniel and Mary had several children. Daniel and his family were introduced to The Church of Jesus Christ of Latter-day Saints. They eventually joined the Church and decided to emigrate from England to Utah. After crossing the Atlantic, they stopped in New York for a while before proceeding on to Utah. While they were in New York, they met another young British LDS immigrant named Richard Sedgwick. Richard became a close friend of the Hall family. He eventually fell in love with and married Daniel's daughter, Mary Emma Hall. After some time, Daniel and his family were able to move on to Utah. They eventually settled in Bountiful, which is just a little north of Salt Lake City. Daniel loved his new land. He applied for, and eventually received, United States citizenship. When Richard and Mary Emma Sedgwick arrived in Utah, they settled next to Daniel Hall's family. Mary Emma had given birth to six children while they were in New York. She had two more children after they arrived in Utah. On January 13, 1899, Daniel lost his sweetheart Mary to the sleep called death. Mary was buried in Bountiful Cemetery. Daniel died May 3, 1900 and was buried next to his wife. Daniel Hall: About all we know about Daniel is included in the very brief history listed above. If you have any photographs or more information about Daniel or his family that you would like to share, please contact us. Daniel Hall's Burial Record: Daniel and his wife, Mary Barlow Hall, are buried in UNMARKED graves in the Bountiful, Utah, city cemetery (Bountiful Memorial Park). Daniel is buried in Plat A Block 7 Lot 8 Space 3. Mary is buried in Plat A Block 7 Lot 8 Space 2. (Source: Bountiful Memorial Park Sexton Records, extracted February 1998 by M.A. Sedgwick.) Copies of the extracted records are in possession of the webmaster at SedgwickResearch.com. Additional copies can be had by contacting the cemetery sexton. Since the graves of Daniel and Mary Hall are unmarked, we at Sedgwick Research would like to participate in the effort to provide headstones for their graves. 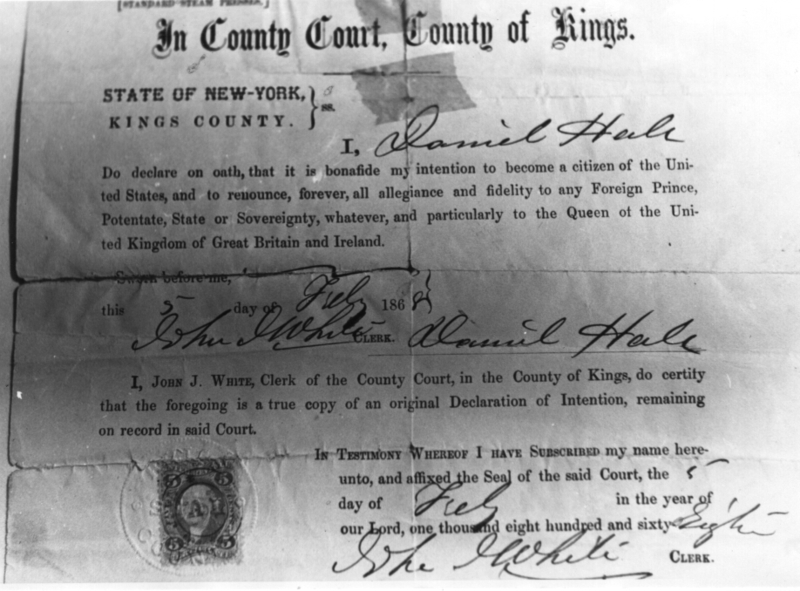 Samuel Hall's Death Certificate: Samuel is Daniel Hall's Father. (Courtesy of Maureen Bryson). Richard Nuttall's Death Certificate: Richard Nuttall is Mary Barlow Hall's maternal grandfather. (Courtesy of Maureen Bryson). Business Records of Robert Hall & Sons of Bury: This Web site, which belongs to Bury Archive, lists records of Robert Hall and Sons of Bury in their archives. Robert Hall was Daniel Hall's brother. Robert's company made textile weaving looms. A description and photo of looms made by Robert Hall & Sons of Bury: This description of the looms was written by Peter Collingwood. Bury Metro Libraries: Local libraries are often good sources for family history material. Information about Bury, Lancashire, England: Bury was Daniel Hall's hometown. A Brief History of Bury, Lancashire, England: A brief history from the municipality of Bury. The Richard Sedgwick Family: Richard married Daniel and Mary's daughter, Mary. This site includes photographs and more information about the family.